The Log Gets Hacked by Antenna TV...Seriously. Title: The Log Gets Hacked by Antenna TV...Seriously. Angst is within myself, even as type this. As we all know, the good folks of Trib-owned Antenna TV turned The Yule Log into a hackfest that would make Freddy Kruger or Jason Vorhees proud. Yes, the show was four hours long, but did they show Chip's fourth hour? No, they repeated the start of the second hour, and later repeated the final half hour. I believe someone at Bozo's old mailing address - 2501 West Bradley Place, Chicago, IL 60618-4718 - needs a serious talking to by loyal and true Yule Log fans. I urge you tohead over to [url]http://www.antannatv.tv/about/contact[/url], call 773-528-2311 or snail mail a letter to Antenna TV's mailing address listed above and tell them to show the entire four hour show, no hacks or tricks. Thanks. Re：The Log Gets Hacked by Antenna TV...Seriously. Alas, I didn't get to see The Yule Log on TV today. But I did notice that some stations that were broadcasting it were only doing 3 hours and some were doing 5. We're supposed to be getting Antenna TV someime in January, but if they are going to ruin this Beautiful Holiday Tradition that several members here grew up with, then I could care less about even getting Antenna TV now. Thankfully I was able to DVR it in 2010 and copied the 4-hour version from WPIX (Dish Network carries this for people who want it for $2.00 each a month along with WWOR, KWGN, KTLA, WSBK. Or you can buy the package). So I have my DVD in and am watching and listening right now. I really wish I could still have Dish Network because at least we know WPIX will broadcast the entire 4 hours and maybe even repeat it. Once again people get their hopes up and get let down by WGN. We were promised that WGN America was going to broadcast the 4-hour version and then they didn't broadcast it at all, but promised it would be on Antenna TV every year and from what you've said, they really haven't kept up with their promise. I'm sure Chip will be contacting Antenna TV about this. It anyone is able to get Dish Network where they live, and aren't anywhere near Manhattan, I would go with Dish Network as you can get WPIX it's just not their HD channel, but at least it is still WPIX. When I had Dish Network, I was getting WPIX and WWOR but didn't want the "Superstation package"
Got up at 3:00 am to watch The Yule Log presentation on Antenna TV. While lying comostose on the sofa, I did detect repetition of some of the songs but couldn't tell you how the recycled it. I had never heard of Antenna TV before and didn't even know my cable box went up to channel 479...(Verizon-Richmond VA). I think there was a short station break maybe about every hour...maybe some fatigued station guy accidently stuck back in the same tape/disk twice? Sorry to hear now that I didn't get to hear ALL FOUR HOURS of original music. I can't think of any programming advantage to repeating portions? Oh well, we'll try to get it right next year and Merry Christmas everyone! I know, James; I was up all night monitoring the program and I am extremely angry about it. After all the checking and double checking with the station to make sure something like this wouldn't happen, it still did. I fired off an angry email to Sean Compton earlier this morning. This odious debacle has dampened my Christmas Day spirits considerably. I put my heart and soul into this program and it's heartbreaking that no matter how hard I try to prevent something like this from happening, it still does. I feel bad for all the folks out there who were looking forward to seeing the entire program and were let down. Mr. Compton deserves a triple decker toadstool sandwich...WITH ARSENIC SAUCE! My condolences, Chip. After all the work you've put into this project over the years, this is one hell of a Christmas present for you. I'm sorry your Christmas morning had to be spoiled this way. I'm watching the first hour on KZJO in Seattle as I type this. I sure hope we're not getting the butchered version out here. That would be such a disappointment to me. I'm nearly seventy years old, and have looked forward to this first viewing like a child waiting for Santa. And so far it's just delightful! I'll be holding my breath when 4th hour rolls around. In the meantime, let's turn this around and use it as motivation for us to work together to make sure that next year The Yule Log will be broadcast in its entirety as you meant it to be. Then next Christmas we can all be celebrating. P.S. The transitions between the musical selections is masterful. You should be a DJ at a club! I'm sure Sean will have some type of excuse that they put in the wrong tape or something, but I believe that WPIX sends the entire 4-hour program to the Tribune Affiliates so they have it so broadcast. I understand your displeaser and even though I wasn't able to watch it on any TV station this year, I feel your pain as you did put your heart and soul into this and was assured that Antenna TV would be the new home for The Yule Log. But with Sean Compton, history seems to repeat itself every year. Going back a few years we were promised they would broad cast the restored 3 hours if my memory is correct, but they only did the 2-hour version then they promised that they would broadcast the entire 4-hour version on WGN America but decided to pull it from their lineup for other programming. So again we were all let down. It isn't fair that the people in Chicago that get the direct WGN channel are able to view The Yule Log, but WGN America and/or Antenna TV won't show it or they show a butchered version. But as least as I've already mentioned that I was able to DVR it last year and from WPIX and not an affiliate. So I have it on DVD now. The year before, we lost signal and I wasn't able to DVR the entire broadcast so I was very fortunate that last year the weather was good and we didn't lose signal so I have a good quality DVD of the WPIX broadcast and even March of the Wooden Soldiers/Babes in Toyland that WPIX broadcast. I forget right now which is the original title, but I do have it with the WPIX Logo on the screen and that means a lot to me because WPIX was my favorite TV Station growing up and to have anything from them on video is a plus for me. It takes me back to when I lived in the area and was watching these programs before VCR's and it is good memories of my youth. I'm so sorry for all the people who depended on Antenna TV for this years broadcast only to be let down by them not broadcasting it in it's entirety and even repeating portions. I can onlly imagine what Sean's response will be. I just wanted to add that I am still watcing my DVD of the 4-hour version and it's a great pick me up for Christmas. I put it in about 7:30 this morning while opening presents for my myself and my little dog Lilly. She doesn't understand that she can open them herself, but yet if I hadn't blocked off the living room overniht, she would've gotten into the presents while I was sleeping lol. Watching the WPIX 11 broadcast since 9AM. They cut away a song midway thru the selection. It happened around 10:30AM. The frame was focused on the burning log, and playing an instrumental song. Then suddenly they chopped it. 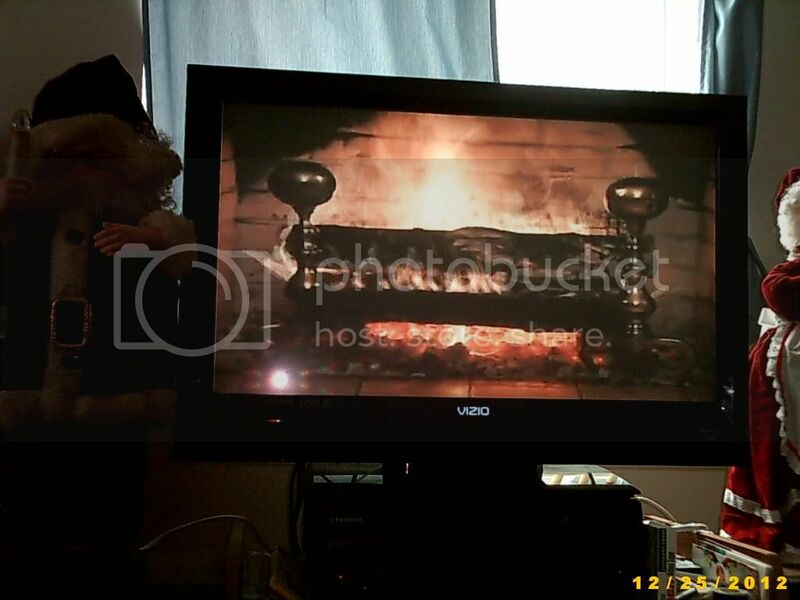 The picture was showing a full out frame of the entire fireplace with the stockings, and playing entirely different song. I literally stopped what I was doing to check the tv. I could say a lot here, but I am going to hold it on reserve. I am very appreciative of WPIX 11 and it’s sponsor for airing the 4 hours of the show today. What I find perplexing is the show originally ran over the course of two days, nearly 21 hours, seamlessly, so much so that my mom used to know what songs were next on the playlist by watching the logs burn and the ash drop. So, my question is, the show is now only 4 hours long…What happened? It’s The Yule Log, not an i-Pod shuffle. Leave the classic alone. It's now 11:48AM and WPIX 11 just did it again...they cut another song's ending short and jumped into an instrumental of "Santa Claus is Coming to Town". Picture remained the same...but the song jump was not smooth at all. Nat King Cole "O Holy Night" at 11:50AM...going to pay attention to how the Noon hour transition is handled. I just went back a few minutes on the DVR to check, and yes, there was a bad transition from the end of David Rose's medley of "Deck the Halls"/"The First Noel", and the beginning of George Melachrino's "Santa Claus Is Comiin' To Town" at around the 2:48 mark. Interesting talk about the cuts and edits, even on the PIX broadcast. Something to look into, Chip? Still good to see the old Log though, as it is every year. And I love the fourth hour. As for the person who mentioned not wanting Antenna TV...sure, it's a shame they aired a hacked version of the Yule Log (I only saw part of Hour One, the portion including my beloved Singing Angels), but don't let it sour you against the station in general, which actually rocks. It's everything TV Land was and should still be, lots of classic TV from the '50s-'90s (with no split-screen credits and whatnot), from Sony's, D.L. Taffner's, and Universal's libraries. I was "The Person" but my name is Susan. I've been wanting to watch the Yule Log for years and even though I was able to for 2009 and 2010 on Dish Network on WPIX as an A-la-Carte channel. But before that I had DirecTV and WGN America decided not to broadcast the 3- hour restored version and that was the only channel to recieve it on. Then in 2009, as I already mentioned, we lost satellite signal so I missed a good portion of the 4th hour from WPIX, but was fortunate enough to get the 4-hours in 2010 wihout any glitches from WPIX, but now that I have Time Warner Cable, they don't carry WGN-America, which doesn't matter being they aren't broadcasting The Yule Log anyways. I just find it disappointing now that we will be getting Antenna TV in January so maybe next Christmas I can watch The Yule Log when it airs, even though I made myself a DVD. I still like to watch it when it actually airs, but they messed it us so bad this year from the comments I've seen about Antenna TV's broadcast, it just makes me think it will happen all over again next Christmas. If you go back through all the posts about WGN America promissing us that they would broadcast the 4-hour Yule Log and then change their mind and then reassure us all that Antenna TV will be the new home for The Yule Log and then find out the problems they had. What's is there to make us want to trust Sean Compton to stay true to his word next year? So I hope you can understand my frustration. It finally looks like I will actually be able to see the Yule Log next year being I can't have Dish Network here and Antenna TV let everyone down, it leaves a huge doubt in my mind. And like Chip, it's really put a damper on my Christmas, not just for me, because I was able to watch my DVD I made, but because of all the people who were counting on Antenna TV so they could finally watch the 4-hour Yule Log. I don't know about the WPIX glitches HollyNIvy noticed but I know Chip pays close attention to these broadcasts and he stayed up all night just to make sure that if there were any problems he could contact the proper people. That is true devotion and I give Chip "KUDOS" for all his efforts not just for the Yule Log Broadcast, but for evertyhing else he does here for us all. Thanks for your kind words, everybody. I appreciate it. And yes, there were even technical issues this year with the WPIX airing of the program. The final one came at the very end of the broadcast when they cut the end of the concluding song in my new fourth hour, Percy Faith's Hark The Herald Angels Sing. This just wasn't my day. This confirms I wasn't imagining things. I had Antenna TV on in the background and during the 4th hour from 6-7 AM I remember hearing "Christmas Bells" by Mantovani and Lena Horne's "Silent Night" and thinking to myself, "Gee, that's funny, I could have sworn Chip's new 4th hour opens with "Adeste Fideles" and had a Bert Kaempfert track not too far down. But I did get to hear the correct 4th hour after all, a few hours later on WPHL in Philadelphia. Hopefully you will be able to find out what happened. I'm just so thankful that I have my DVD that I made from last year's broadcast being I missed most of the 4th hour from 2009 when I lost satellite signal. But the 2010 broadcast didn't have the Shout Out to you for the 4th hour. But I still feel bad for everyone else who may not have been able to see the Yule Log without any glitches. I hope the problem wasn't in the actual tape that they sent to all the affiliates or however they do it. I know sometimes via satellite they up-link to the TV stations who can then can down-link it and make their own tape to broadcast at a later time. Such as with other things with Radio and TV stations who broadcast a syndicated program. They may broadcast the same episode, just not on the same day or time for that particular program. I can remember back in the day of the C-Band and KU-Band satellite receivers. I had this friend who was Dealer and Installer and he would pick up any satellite feed he wanted and I was visiting him one time and at 8:00 am, I was watching "Day's of Our Lives" which was that particular days episode and it was a network feed, but not one that the regular satellite TV user could receive. Then it was on the local TV station that day and obviously the same episode. I know this won't happen, but it would be great if all the Tribune Affiliates could re-broadcast this year's Yule Log before the end of the year to make up for the problems they had. They owe us that much at the very least, and a simple apology just won't cut it. Please understand everyone that I am not dissing WPIX or anyone, but something obviously happened with this year's tape. If it was just one station then it could be that stations glitch, but it wasn't just one Antenna TV affiliate or WPIX from what I have been reading. Hi Susan. I understand what you're saying. Since I also have both the old version and Chip's extended version of the Yule Log recorded off WPIX Ch. 11, I sometimes shut my eyes, relax, and doze off lightly to the show on Christmas morning. Yesterday, during a classic Percy Faith song (maybe DECK THE HALLS) an abrupt ending towards the song's end woke me out of my light sleep - it was that noticeable! Yes, I know Anthony. I had the Yule Log on in the living room and when I heard that abrupt cut in Percy's song, I ran so fast out of the bedroom that I banged my head on the door jamb. My present on Christmas morning was a bump on the head, a headache and a large quantity of heartache. Between Antenna TV butchering my program and then the technical glitches in the presentation on WPIX, it couldn't have been any worse for me. I had people all over the country counting on seeing the complete 4-hour program via our national Antenna TV feed and they were all let down. I'm still receiving emails from folks about it. My work all year is geared to this one day -- and then when it gets here, I had nothing but abject misery. To say that Christmas Day this year was not a good one for me is the understatement of the year. Irregardless of the technical difficulties which were out of your control, I want to thank you from the bottom of my heart for all your efforts in getting the Yule Log to be broadcast each year. I'm so sorry about you bumping your head, but I probably would've done the same thing. Yes, I am a very devoted WPIX Yule Log Fan and am proud to say that I was able to watch the original 1966 broadcast. And, I don't mean this in a negative way, or putting anyone down at all, but my devotion, or anyone else's for that matter, can't even come close to it as yours does. I can really feel your pain this Christmas Season. And as I've mentioned I was able to view my home made DVD of the 4-hour broadcast from 2010, but I still feel so bad for everyone who had their hearts set on being able to view it this year, and some for the very first time I might add. I can only imagine what your email or phone conversations to the various people you will be contacting regarding the problems with this year's broadcast and I don't envy what you have to do. Then after all is said and done, you will have to start all over for next years broadcast so again I give you KUDOS for all your efforts and devotion. Sorry for the non-posts - will get back to you on Miracle ? about the Dutch Girl who in reality was not dutch but a great little actress! I was in the living room when the bad jump happened on Deck the Halls by Percy Faith. We all do thank PIX for heading the calls to return the Yule Logm but they need to get it right! Maybe the techs there had too much Egg Nog? PIX you should rerun the show New Years Day and get it right! And the bunk that it cannot be shown on Christmas Eve is jut that BUNK! How many networks pre-empt regular shows for specials? Every network does! Simply start it at 7:30 and run it to 11:30 then show the classic Honeymooners episode! Then Midnight Mass! And to make it a real classic Christmas Eve show The Bishop's Wife at 5:00pm as they used to! Announce in the spirit if Christmas they are giving their news staff the night off! And let the show begin and watch the ratings soar! Yes, I have advised WPIX about the technical glitches with the broadcast and I am confident they will pinpoint the problem and get it worked out so it doesn't happen again next year. As for actress Marlene Lyden from Miracle on 34th Street, I posted a message on the board earlier this year in April about her. She died four years ago after a long career as a real estate agent in Las Vegas. I even posted a picture of her as she looked just before she died. Alvin Greenman and I were talking about who is still alive that appeared in the movie, and besides him, the only other one we could think of was Maureen O'Hara. So Alvin and Maureen are the last two survivors from the motion picture. So sad. To see that post that I filed on Marlene last April and see her picture, Click Here and scroll down to post #43 (my first of two posts dated April 2, 2011). I think that the person that played Thomas Mara Jr is still alive, check out the special edition dvd of the film he appears in the old episode for AMC's Backstory I think from the 1990's. Hope Mr G is doing okay! Send me your e-mail again I will send you share with you some intersting images from the film that you will love seeing! Would love to speak with Mr G hope you can arrange it. Actually had to exchange e-mails with the Academy and I was able to relay that Ms O'Hara should get Lifetime Oscar - long overdue and she deserves it on the strengths of these three films alone THE HUNCHBACK OF NOTRE DAME, MIRACLE ON 34 STREET, and THE QUIET MAN. And that is not counting the other great films she made. I got to meet her twice and she is one classy lady. Her brother was great too, the late Charles Fitzsimons. He appeared in THE QUIET MAN as the IRA man and later he went on to be a producer on tv's classic BATMAN!! He told me many great stories about the Duke, Fred Astaire, Gene Kelly etc! Thanks for all the great work you do in keeping the Yule Log burning brightly! No, Bobby Hyatt is not still alive; he died of cancer in 2007. He was only 67. As for Maureen O'Hara, her standout picture more than any other was director John Ford's great classic, How Green Was My Valley, which won the Academy Award for Best Picture of the year in 1941. You know what Chip I should have mention HOW GREEN WAS MY VALLEY, when of my prized items that I have in my collection is the laserdisc version of that film and the cool thing is I had met Roddy at a event and he was a major collector of film and I brought the disc with me, he was thrilled that it was released as it was long delayed, so after discussing Planet of the Apes make-up we focused on HOW GREEN and he pointed to Ms O'HARA and himself on the cover and he said he had just spoken with her that morning. He signed the disc jacket and talked a bit more. About 6 years ago when Ms O'Hara appeared at Macy's again I was able to give the same disc to a Macy's contact and she gave her the disc later at a private meeting in the exec offeces. A few days later I got the call to go back to the store and pick up my disc and a copy of Ms O'Hara's book and she signed the other corner on the disc jacket! So I have two of the cast signatures on the disc! Oh, and I forgot to mention in my previous email that I will mention to Alvin that you would like to speak with him. I will mention it the next time I talk to him, which will be in a couple of weeks on his birthday. I'll contact you privately off the board and let you know. Look foward to hearing from you and wish him a happy b'day and I will keep my fingers crossed that I will talk with him! And let the countdown to the Yule Log 2012 begin! Well, We finally have "Antenna TV" I'm not sure what time they switched over from NBC Universal Sports, but it was before midnight. It isn't in HD, which I've mentioned before being the programming they show is all 4x3. Hopefully though this years Yule Log broadcast will go off without any hitches. Because we have Time Warner Cable, they haven't updated the guide, so it was showing all the programming for NBC Universal Sports. But OTA (Over the Air), it does show you the name of the program and the one after it. It was good to see George and Gracie again and then they also showed ab episode of "The Jack Benny Show" with Peter, Paul, and Mary. Once they get the guide straightened out on Time Warner, I'm going to be doing a lot of DVRing being there seems to be these great programs on overnight, then when there isn't anything good on regular TV, I can watch was was DVR'd. We first got AntennaTV when we switched over to Verizon FIOS in October, and I love it. I can't believe how many times a day I end up watching something on there, especially The George Burns & Gracie Allen Show, and The Jack Benny Program as you mentioned, as well as Bachelor Father, Father Knows Best, Hazel, and Maude, none of which I've seen locally in syndication in quite some time. FIOS is in my area, just a couple addresses down the road, but in this area, everything is underground so it would be a huge effort to get FIOS, but then too I don't know if they would carry Antenna TV because it is a sub-channel of our NBC affiliate and they don't necessarily have to give us the sub-channels of our locals. But FIOS is in many ways better than Cable TV. Time Warner is giving us the sub-channels so it's not a seperate network that they are offerening us, but even if they ever decide to drop the sub-channels, I will still be able to pick it up OTA with my Digital tuner. I haven't seen Dennis the Menace or Hazel in many years and I hope I will get the chance to see the entire series, but I have seen this happen before with other networks that once they've shown every episode, they get rid of that particul program and put something else in it's place and being we're coming in a year after Antenna TV's launch. I know I missed a lot of great programming, since I've been following them on Facebook. My Suggestion on how the Tribune folks they can make it up to us: Well, this Friday is "Little Christmas" - the feast of the Epiphany, the 12th day of Christmas - January 6, 2012. I suggest that WGN nationwide cable should run the complete unabridged 4-hour YuleLog version from 1AM to 5AM EST on their superstation cable feed, along with Antenna TV affiliates; would be nice if WPIX could fit it in too. Chip, think maybe you could get us a last blast at an 'encore' performance with the correct full Yule Log airing on January 6th? Heck, even one hour overnight each of the next 4 days would work too in my book. "On the Twelth Day of Christmas, Tribune gave to me: The whole Yule Log..., 4 DVR's, 3 big screens, 2 old Beta tapes, and a brand new pair of rabbit ears......"
I know Chip put his heart and sole into the most recent Yule Log and I surely do appreciate that. However for all you out there complaining about glitches and out of order tapes lets put in perspective. I will give you me perspective. I live in the sticks. My only access to anything Internet, TV etc is thru Satellite. I have Hugesnet for Internet and Directv for television. I am maybe 50 miles from the major TV stations in Detroit. None of the locals have Antenna TV and Directv does not cover anything that gets the Yule Log. So I am just out of luck so as you whine about the glitches remember us who say "Man I would love to get it at all." So I say thank you Chip for anything that you can get out there. Maybe WGN Superstation will go back to the Yule Log. Unfortunately, an encore showing of the program would be out of the question as it would be too heavy a financial sacrifice for the affiliates to make. Please keep in mind that it is shown commercial-free. The new permanent home for the national coverage of the Yule Log is Antenna TV. This replaced the coverage the program had on WGN America. Sean Compton (President of Programming for Tribune Broadcasting) will not air the program on WGN America anymore. To read about my announcement of the new Antenna TV coverage and my conversation with Sean about this, Click Here. This is for Susan who I know lives in the Buffalo area. What channel is Antenna TV on? I too have Time Warner cable and have been looking forward to Antenna TV but I can't find it! I hope they get the Yule Log straightened out for next year. CHIP! Thanks for all your hard work! If you're in the Buffalo area, Antenna TV is on channel 114. It used to be WGRZ Digital Chanel 2-2 NBC Universal Sports. But the Guide has been messed up. Sometimes it has the actual program listed but other times it shows "Data Not Available" It isn't HD, but the picture quality is much better than Retro Television is. I would have to try and look into it further to see if it's 720p or smaller, but I have seen some great shows. You should be able to go to Antenna TV's website and get a listing. The first night I realized we had it, I was watching The Burns and Allen Show and then The Jack Benny Show. I was surprised last night as I was going through the channels and hear a very familiar sound from Thames TV Broadcasts and it ended up being "The Benny Hill Show" This was I think around 1:00 am. I had trouble falling asleep and then while going through the channels, the receiver locked up and took a while to catch up with the remote and I inadvertently ordered a VOD/PPV and when it popped up on the screen, I immediately pressed the "Stop" button and then called TIme Warner Cable to explain what happened so I wouldn't be charged for it. But I had to wait on hold for 20 minutes. Then they had to run some tests to see if the signal strength was good and the signal back to them was good and it was; so she reset the box and it took about 3 minutes more and then she had me do the same thing with the remote as I had done before when it locked up the receiver and this time it didn't lock up. Now, I don't know if every TV Station that carried NBC Universal Sports is switching to Antenna TV or even if NBC Universal Sports is gone of the air entirely, but at least in the Buffalo area, WGRZ 2-2 is carrying Antenna TV and even if they weren't giving us the secondary channels, WGRZ is strong enough to pick up Over The Air with a Digital TV Tuner or Digital To Analog Converter Box. I just wish WBBZ, formerly WNGS had a stronger signal because they are still carrying THIS TV on their secondary channel 67-2, but I can't pick them up OTA with an indoor channel and Time Warner Cable is only giving us their primary channel which is MeTV. Though all 3 networks Antenna TV, MeTV and THIS TV show some Classic TV programs, some show the same series such as "All in the Family" or "Sanford and Son" which I believe are on TVLand too. But hopefully The Yule Log will go on without any glitches this year. Even though I made myself a DVD from the 2010 broadcast that I DVR'd, I still like to watch it when it airs if I am awake. Oh well, sorry this is such a long reply, but I did want to let members know that if NBC Universal Sports isn't broadcasting anymore, they should check to see if they have put Antenna TV in it's place. "then it would stop and go to Music Choice Sounds of The Seasons channel 433 which at midnight stopped playing Christmas music this morning "
Part of me actually hoped that they would extend the Christmas music on "Sounds of the Season" longer than just to the Feast of the Epiphany, going to Valentine's Day, at least. This was my first holiday season with Music Choice, and I appreciated the 2+ months of Christmas music on that channel, and the much-shorter period that they gave us of holiday music on the Easy Listening channel. If I remember correctly, several years ago, Music Choice Sounds of the Season would go almost 3 weeks into January still playing Christmas music. I was disappointed with their playlist this year though. Not that I was able to watch it 24 hours a day, but the times I did, I had heard several repeats and even some Contemporary Christmas songs by newer artists and Billy Gilman's version of Silent night from his 2000 CD "Classic Christmas" was played at least 3 different times in the same day. There were some great Classics too, but more Contemporary artists then they used to have. But I guess with everthing else, there's probably Copyright issues for certain songs so they play what they can. but at least there are the free online Christmas Radio Stations and they usually play more of the Classic/Standards. Anybody ever heard of a video music service called "Galaxie" music? After losing Music Choice and then get two totally worthless music services after that, my Cablesystem switched to Galaxie last week. They at least have an 'Easy Listening' channel and a holidays channel. Too early to see how large/small of a playlist they have and if they're better or worse than the shrinking playlists on the Sirius/XM decades palylists. Bumping to say I'm watching Antenna TV right now, and this fourth hour is on. No butchering, no bad edits (save for the transition in the middle of hour two or the fourth hour) and all is well. I haven't fully watched the Antenna TV version as I am watching live WPIX's broadcast and DVR'ing it, but Antenna TV the video didn't even fill the screen. WGRZ 2-2 is in 420i while the main channel which is our NBC affiliate is in 1080i and 16:9 Screen Ratio but of course on the Analog TV, it would be shown in Letterbox or full screen which would cut off the left and right edges of the image. Yes, this is in SD 4:3 screen ratio, but it was like I was watching The Yule Log inside a box. The local station's Call Letters were on the screen in the picture but were above the boxed in version of The Yule Log. I did DVR it, and I'm also DVR"ing KWGN's broadcast, but as a back up, I used my VCR for Antenna TV but used a T-120 tape and had to use SLP setting for record so the quality isn't good, but I will also include a picture of what was airing when I went into the bedroom to take the pictures "The Flying Nun" this is being shown on a 25 inch Analog TV . I'm using a Digital To Analog Converter box connected to the VCR and then to video inputs on the TV. You will notice all around the image of The Yule Log are black bars, to they are hard to see because the TV itself is black, but the next image is brighter and you can see the difference. I could not change the Aspect Ratio either being it is set by the program on the Digital to Analog Converter box, but on my DVR, I was able to watch it for a few minutes before KWGN and WPIX were supposed to start and while I was DVR'ing it, I could stretch the image to fit 16:9 ratio, but it still had the black bars all the way around The Yule Log for the Antenna TV broadcast which was also done with a built in Digital Tuner being Dish Network doesn't give us any of the Sub-Channels or our local channels. So the Antenna TV Broadcast is Over The Air with an antenna. This is a scene on Antenna TV from The Flying nun and it fills the screen and is the same ratio 4:3 so I don't know if it was our local affiliate WGRZ Channel 2 that changed the ratio before transmitting The Yule Log or if all Antenna Affiliates got the same image I did with the black bars all around all 4 sides. I can't check KWGN's broadcast while DVR'ing WPIX because both are being DVR'd at the same time, though they started at different times, they are an hour apart. KWGN started at 8:00 AM Eastern and WPIX Started at 9:00 AM Eastern. I am able to watch a DVR'd program while other programs are being DVR'd so I decided to check Antenna TV in the Living Room and right in the middle of Sleigh Ride by The Ray Conniff Singers, they aired several local commercials. on Antenna TV. and then came back while O Little Town of Bethlehem by Frank Sinatra was just about over. So I am very displeased. I thought it would be broadcast commercial free on Antenna TV, but I don't know if the local affiliates decision or if that is the agreement they had made with Sean Compton's permission or not, but I am very displeased that this has happened. At least though I do have the WPIX broadcast and possibly KWGN, but I can't check that since it is DVR'ing. Also, I hope we don't get any signal interruptions as that would ruin everything. Chip, Susan, OGO, Rich, James, Diane, Will Clueless, Jim, Maxx, JMFabianoRPL, and to all the many regular posters on The Yule Log: A Merry Christmas to you all, and I appologize for those I didn't mention specifically by name. Any chance anybody has a DVD copy of the Yule Log they'd care to share? I would be willing to pay for postage. Or, if you have the 4 hours on VHS, I'll do the conversion to DVD for you and return your tape with a DVD. Susan, you did a great job taking photos off of a TV screen - a tricky thing to do, and well done. Merry Christmas to all; big snowstorm coming to the Ohio valley; just in time to head back to work! Our local station once again listed a 5-hour window for the Yule Log this year and I figured they'd mess it up the same way they did last year by transposing the third and fourth hours so I was somewhat bummed out by the thought. Fortunately, we found out a short while ago that DishTV allows a la carte addition of certain channels to our basic package so we sprang for WPIX for an extra $2 a month. 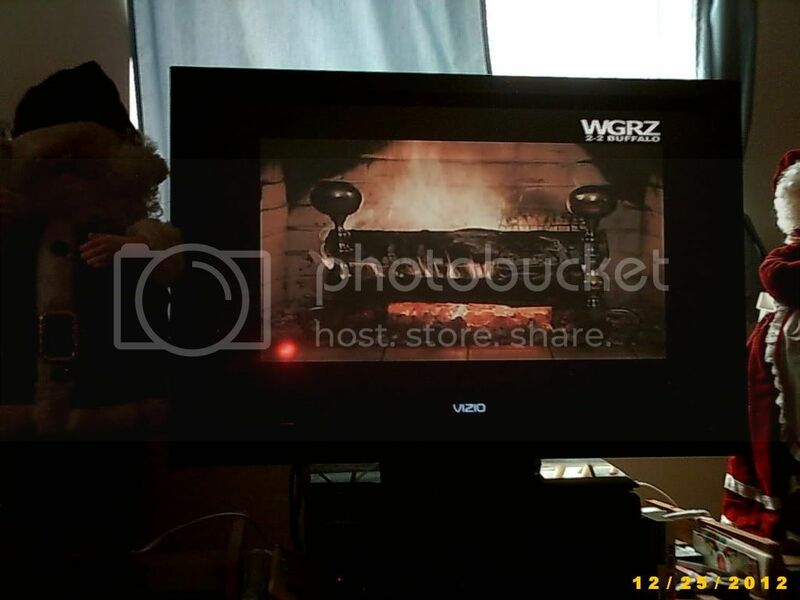 This allowed us to witness the 2012 edition of the Yule Log from the Mother Station which was awesome to say the least!! Once again, kudos, applause, congrats, to Chip for the fourth hour; it is wonderful to have even more of this fine music and our favorite virtual roaring fire to warm our hearts on this special day. It was hard taking the pictures of my TV screens because it doesn't do very well in low light or artificial light. Then after I press the button, it takes about 2 seconds for it to actually take the picture and if I move, things get blurred. Then, especially on my HDTV, I had the flash covered with my finger, but it still lets some of the flash through and it reflects in the TV. I hope anyone else who was able to watch it on Antenna TV had better results than I did. I wasn't expecting commercials and it not fitting the screen. I did expect it to be in SD being the type of programming that Antenna TV normally shows, was done prior to HDTV and the programs were made in the 4:3 ratio. WPIX and KWGN were also in SD but they filled the screen and I haven't completely watched KWGN's broadcast because it was on an hour earlier than WPIX in my area, I watched WPIX but did DVR all 3 of them and WPIX went off without a hitch. Though I can stretch the image to fit the 16:9 ratio it is still SD, but it looks like it's HD so that is all that matters. I don't know what your local station was, but I had been checking my program guide and for KWGN, they showed Christmas Eve Day a 1-hour broadcast of The Yule Log, then because I am in the Eastern Time Zone, they showed an hour again of The Yule Log and then the 4-hour broadcast. I asked Chip about it in another thread he had contacted them and explained that the 4-hour broadcast would start with hour 2 then 3 and 4 and finally hour 1 and the 1 hour that was listed before was supposed to be hour 1 but because I wanted the 4-hour broadcast, I haven't watched it yet, but it is supposed to be 2, 3, 4, 1. But being I haven't watched it yet, except for the first few minutes, I don't know how it turned out. Here is the link to the thread. Scroll down to post # 18 and he explains it, but in my guide, instead of it being hours 2, 3 and 4 and then a separate hour 1, my guide had it listed as 4 hours so that is how I DVR'd it. Not counting the repeated hour 1, before the 4 hours. I hope this isn't considered Double Posting as I was responding to Johnny's post, and after I had sent it, I saw the message from Jeff so I wanted to respond to his message and didn't even see Jeff's post until I answered Johnny's post. Just want you to know how much i appreciate your efforts on the Yule Log. Ever since I discovered your site, my family and I have enjoyed watching it each year on WGN as we unwrapped our presents on Christmas morning. Last year I was unable to tune in because we don't get Antenna TV in my area. I can only pick it up from Raleigh when the weather is good. I can understand your frustration with all the problems that Antenna TV has had in broadcasting the complete program. Just wanted to mention a solution that i came up with to watch the program. This year I was able to see it via WPIX's live streaming on the web. i was even able to watch it on my TV via my Apple TV mirroring from my laptop. To be specific, I have an Apple TV 2 and used AirParrot ( a program I got from the web) to mirror it from my Macbook. The newer MacBooks have the "mirroring feature through the Apple TV" built in. I made sure to try it out before hand on WPIX's live streaming of the Saint Patrick's Midnight Mass the night before. It worked like a charm. I did notice the abrupt end to the last song. I really enjoyed your picks for the fourth hour. Some of the music I have never heard before so I'm going to check your song list to see what those selections were. Anyway, MERRY CHRISTMAS AND A HAPPY NEW YEAR TO YOU. Thanks for all your hard work and HERE'S TO NEXT YEAR! Glad to hear how much you enjoy the program, Chris! Also glad to hear how much you enjoyed my new fourth hour. A Merry Christmas and Happy New Year to you too! I finally got a chance to view THE Yule Log = what a great masterpiece. The story behind the show was fantastic as well. Glad you were finally able to see the program and that you enjoyed it so much. Glad you were able to see the program and learn how The Yule Log came to be. Happy New Year to you too John.